Art has now retired from the U. of Calgary. He and Judy continue their part-time private practice. Naomi has obtained her Master of Integral Health Education Degree from the California Institute of Integral Studies. During her stay there, she met another student, John Hofmann, from St. Paul, Minnesota. Aaron is pursuing his interests in international and global issues. He plans to continue his studies at Carlton University in the near future. Judy remembers, with gratitude, the dear neighbors, teachers, and friends who were so kind and supportive during her growing-up years in Erickson. Editor S Note: John and Naomi were wed on Febrnary 5, 2000, in San Francisco, where they presently reside. When the pages closed on the local history book, John and Harriet had just returned from a trip to New Zealand where he celebrated his seventy-fifth birthday at Mount Cook. For Harriet, it was the fulfillment of a long time dream. Getting ~.1Q.Eicl.d. (Volume 1) off to the printers was of special interest to her as she had been involved from the beginning. In the autumn of 1985 they moved into the comfort­ able home Garth had built for his family. They continued to do some travelling, taking bus tours to the Maritime Provinces, the Alaska Highway and the Black Hills in South Dakota. There were also trips to visit family and friends at the west coast. 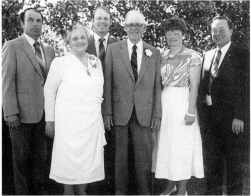 In July 1987, their family held a very special celebration for them for their fiftieth anniver­ sary. In the spring of 1992, John's health was failing and he passed away on September 22, in his eighty-fourth year. Interment was in the Bethel Lutheran Cemetery in Danvers in the first Leo family plot where his grandfather, John T. Lee, is buried. His was the first grave in the cemetery in 1909. In 1994, Harriet had one more trip overseas to Sweden and Norway, with Craig and Ruth Lee. It was a great visit with so much extended family. Of special inter­ est was seeing the site of the Olympic Games, especially the huge arena cut out of the centre of a mountain with homes still occupied on top. Long a victim of osteoarthri­ tis, after the misfortune of a couple of falls and broken bones, Harriet is quite dependent on a walker. She is grate­ ful to family members who make it possible for her to remain on the farm that has been her home since 1937. David and Karen are retired and live in Calgary, AB. In 1990, Brent married Beverley Hamilton, a teacher. Brent has a doctorate in Music Composition, has taught for several years at Mount Royal College in Calgary and, in May 2000, will begin a position at the University of British Columbia. They have one son, Jamie, born in 1997. Brian is employed in Edmonton. He also coaches senior football at his former high school in Sherwood Park. Garth IS family continues to live in Winnipeg but Bev has a cottage at Ditch Lake, which they all enjoy. Melissa has worked for several years at the Oakview Place Extendicare Nursing Home while taking courses in the Faculty of Recreation Studies at the University of Manitoba as an Activity Therapist, especially Geriatric Therapy. In May 1995, she married Douglas Wall, an Avionic Technician employed by Air Canada in a junior manage­ ment position. Stuart is a student at Red River Community College taking a course in Woodworking Technology. Craig is still employed with the Manitoba Department of Agriculture serving as assistant deputy minister. Ruth has retired from her nursing career and they are both active volunteers in various areas. Cheryl married Peter Loewen in 1985. She has a degree in Commerce and Peter has a doctorate in music history. They live in Charleston, Illinois, where he is a professor at the University of Eastern Illinois. They have two children: Erik, born August 4, 1995 and Lauren, born Febrnary 12, 1998. Robert is a lawyer with the firm of Aikins, Macauley and Thorvaldson in Winnipeg. In September 1998, he married Emma Iliffe who is pursu­ ing a doctorate in microbiology. They had the unique experience of meeting while filling sandbags during Manitoba's flood of the century. Trevor is a medical doctor completing a surgical residency at the University of Manitoba Faculty of Medicine.